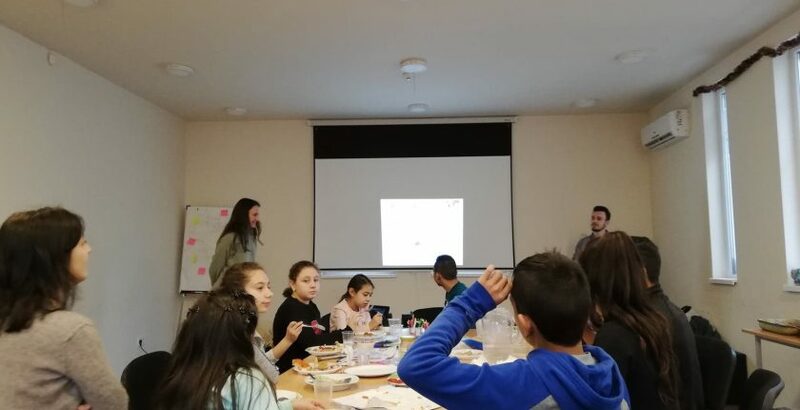 On 29th January 2019, the EVS volunteers of the International Foundation for Y-PEER Development based at PETRI-Sofia, Viktorija from Macedonia and Katrina from Austria, together with other EVS volunteers from Turkey, Italy and Spain participated in an event – intercultural afternoon organized by HESED – Health and Social Development Association. 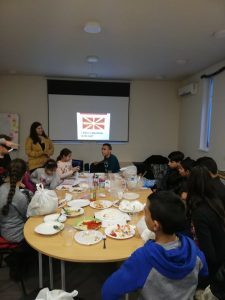 The idea of this event was to give a cultural insight to the Roma children in the neighborhood of Fakulteta in Sofia about different cultural traditions of the countries of the volunteers. The event also provided a space for the volunteers to share information about their home countries in an interesting and interactive way, as well as to increase the multicultural understanding. Every volunteer prepared some traditional food and a game or a presentation of their country. The volunteers actively engaged the children in their presentations and motivated them to participate in the quizzes and games. Additionally, the children had the opportunity to enjoy the different styles and tastes of food from each country. Baklava from Turkey, tiramisu from Italy, delicious sweets from Spain, cake from Austria and last but not least, the very popular Shopska salad, ajvar, and red peppers from Macedonia. Overall, the afternoon event was a success, the children enjoyed the food and participated in the games and quizzes. We truthfully hope that next time we will be able to encourage parents to come as well and to share with us the experience of intercultural exchange.